Big weekend for US college basketball fans! Who to bet on?! Good question! With three number one seeds (and one underdog) in the Final Four this is a tough one to call. Kentucky has been a favorite from the start at American-style online sportsbook AllYouBet and still is going into the semi-finals. But judging by the amount of betting action they've been getting, a lot of people think the underdog Spartans have pretty good chance too. US men's college basketball championship takes place in Indianapolis this weekend. 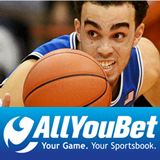 If you're betting on college basketball do it at AllYouBet and get a 50% bonus on your deposits by entering bonus code MMBONUS15. And if you wager more than $1000 on the Final Four you can look forward to a $100 Free Bet on Tuesday.